Let’s face it, TV is an important part of our lives. But if your senior living community is still stuck with cable or satellite TV, chances are good that neither you nor your residents are happy. In fact, in the most recent American Consumer Satisfaction Index, TV and Internet companies finished at the bottom among all industries..
A Customer Support Center that can troubleshoot, program favorite channels, change source selection and more – remotely, from our home office! And of course, the help or our onsite Technology Concierge to keep everyone happy. InteracTV is the kind of TV service where residents can watch their favorite shows on the day they move in. Where they can browse the community channel to schedule appointments, view community events or even call local businesses and restaurants. Where neither you nor your residents have to deal with costly, time-consuming installations or maintenance. 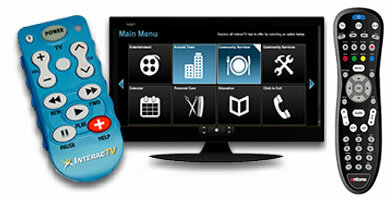 In other words, InteracTV is precisely the kind of TV service your residents want, and you need.